Of Dominic’s worthy son St Louis your hearts and voices raise. It was in your nice Southern land, that first he saw the light. In Boyhood’s careless days his thoughts were always turned to Heaven. And soon he bore the Gospel’s truth far off to Western land. The poisoned bowl, the risk of life, nothing could quench his fire. with love he looks on us, who weep in this sad vale of tears. Pray that his spirit still may reign in us, his children here. And by our ev’ry word and act to make Him better known. 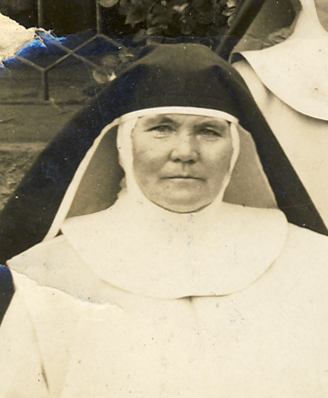 Sr Alacoque was born in Port Elizabeth and was the first South African to be received into the Congregation in 1895. She taught at the Convent Schools in Potchefstroom, in Klerksdorp and in Cradock. She received her B.A. Degree at Rhodes University and later taught at the Motherhouse and served as General Councillor and as Mistress of Schools. She died at the age of 76 after several years of illness at the Mater Infirmorum. Thy tender, trusting heart from such-like woe. Of Love’s vast might I heard a poet speak. He called it “strong as death to work its will”. In vain to soothe some loved one’s lightest woe! Maketh love’s impotence love’s chastening rod. Thou didst bear her tainted touch. Yet be Thou to pity moved. Wilt Thou me alone disdain? Jesus! must I plead in vain? Has left a shining impress on thy brow. God loved the world and gave – “His only Son”. Or wilted in passion’s hear? All that there is of me. Lord, take and use them all. Thine ever let it be. And make me only Thine. Touch Thou her wounds and make them whole. Silence her bitter remorseful dole!Thy little creature wilt thou slight? Giveth new courage to run the race. That lead to my Home in the Heavenly land. Far down from Thee, my God, my All! Her Love is at her side. Oft in the silence comes a Voice. As she inclines her ear. Both time and pace have flown. For her to live is Christ. Earth’s joys that once sufficed. Taste of the Nuptial Feast. With Jesus, she must go. The Bridegroom did but play. Come, Spouse of Christ the King. With the dread power of God’s anointed priest. A power to which his vails, as earth to heaven! In headlong rout at bidding of God’s priest. The noblest heart might in that power rejoice. For a soul ransomed. Priests sway angel throngs. All honour, reverence, love him, and obey. Not subject man, but Sovereign God obeys. God the Almighty owns the priestly power. Your hands have wielded now these fifty years. And wish you – but, what is there left to wish? That wondrous summer fifty years ago. His precious life for many years! 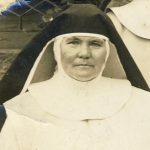 Sr M Alacoque Brien o.p.